The weekend sure did sneak up on me. A really busy work schedule has kept me at the office more hours than I'd care to admit, but that's the nature of this time of year. Fortunately, the weekend has a bunch of events that I'm really excited about, including a few races that I didn't include in my November preview. Tonight I'll kick off my weekend at the Rihanna concert in the New Orleans Arena. I'm interested in seeing the spectacle surrounding the show more than anything else. The ticket says it starts at 8pm, and there's a couple opening acts. Riri better be on time, because I turn in to a pumpkin well before midnight. I also need a few hours of solid sleep before racing on Saturday morning. The race in question on Saturday morning is the Middendorf's Manchac 10 Mile Run. It's my first time taking part in this race, but looking forward to having a supported long run as part of my training leading up to a full marathon in a couple weeks. The 10 mile distance is apparently popular this weekend with the Goldenfliers 5 & 10 Mile Road Race around the Baton Rouge lakes also on Saturday. I did participate in this run a couple years back, and its a really organized race on a very pretty course. I'd recommend it for anyone who may be in the area looking for an event. Anne resolved to run the 5K Corporate Cup Second Line for Literacy on Sunday morning, so I decided to show my support by volunteering with the New Orleans Track Club at the race. Believe it or not, this will be my first time volunteering at an event. I'm anxious to see what it's like to be on the other side and not actually running the race. The proceeds support literacy among children in the community, and I'm looking forward to helping out for both the runners and the cause. Don't forget that pro sports are back in action this weekend as well. Your New Orleans Pelicans take on the Philadelphia 76ers at 7pm on Saturday night in the New Orleans Arena, while the New Orleans Saints kick off a late matchup against the San Francisco 49ers at the Superdome on Sunday afternoon. Get out there to cheer on some runners and cheer on the home teams this weekend. 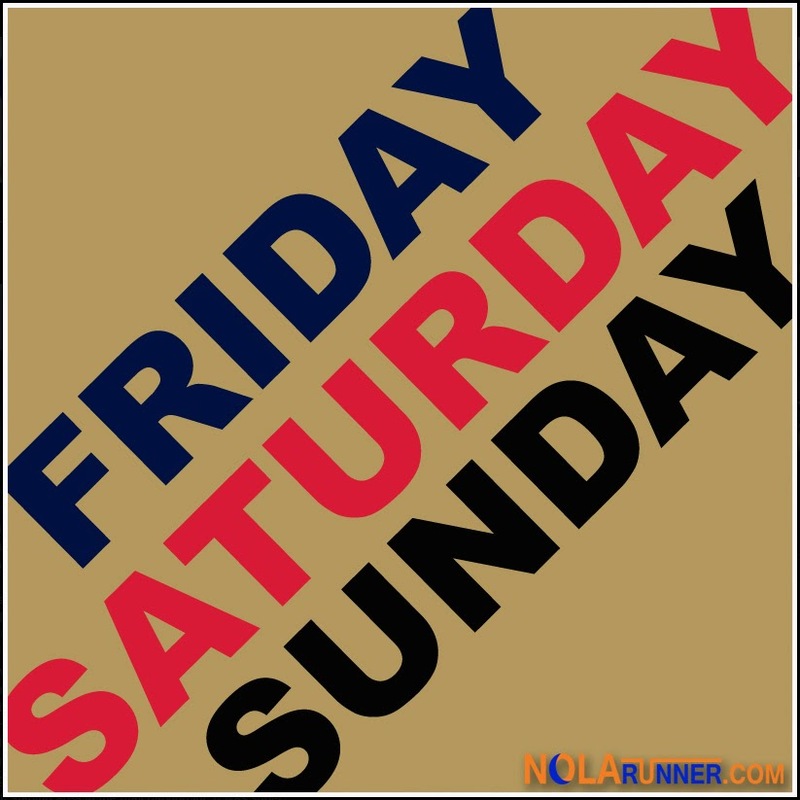 How are you participating in the weekend's events?